It’s hasta la vista for beleaguered electronics giant Circuit City. The 60 year old company, which declared bankruptcy in November, was unable to agree to terms with a buyer in time to meet a Friday deadline. Rather than seeking an extension, that likely would have only briefly prolonged life, the company will liquidate. 765 retail stores in Canada may still be sold, and are looking at January 23rd offer deadline, but 567 U.S. stores are gone, effective March 31st. Thousands of jobs will go with them. The merchandise sales will begin tomorrow. "This is the only possible path for our company," Circuit City’s Vice Chairman and acting Chief Executive James Marcum said in a statement. "We are extremely disappointed by this outcome." There had been buyers trying to salvage the company. Mexican billionaire Ricardo Salinas Pliego had bought 28.5 percent of the company after the initial bankruptcy filing. He was hoping to take the brand and inventory to his Latin American home base. Lenders reportedly weren’t willing to back the idea unless suppliers gave the stores merchandise on credit. Suppliers, unwilling to carry that kind of risk, balked at that idea. San Francisco private equity firm Golden Gate Capital was also circling but there wasn’t enough time for the firm to evaluate the business to its standards. Rumors were Golden Gate wanted to buy only a portion of the company, select stores and its online presence along with inventory. One possible angle suggested interest in select real-estate leases and property. The bankruptcy court deadlines created a fixed obstacle in the way. 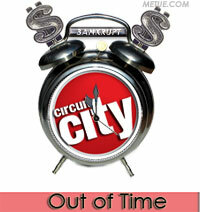 Circuit City originally began as Wards, a local TV Virginia TV reseller in 1949. The company went public as Circuit City in 1984. Initially, it boomed but in the past eight years, the fortunes reversed direction. Circuit City, overtaken by Best Buy and hurt by both the Internet and “big box” sellers like Walmart was in a downward spiral long before its November bankruptcy filing. In 2005, Highfields Capital tried to buyout the company for $17 a share after acquiring a position in the stock. Circuit City turned that down. In 2007, the company laid off thousands of workers to trim expenses and saw leadership roles empty. Last spring, the company explored sales options, including an ill-fated offer to tie up with Blockbuster that flat-lined (it was withdrawn in July). 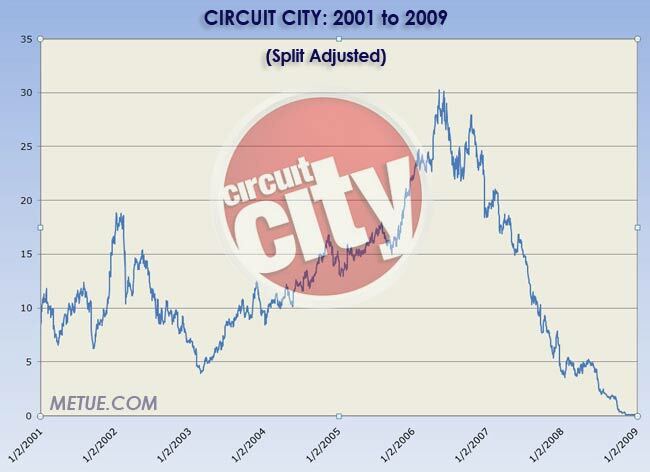 Leading up to the November declaration, Circuit City stock had dropped dramatically since 2006 (see here for comparative chart showing CC, Best Buy and Walmart. Be sure to click the “date range” for a multi-year comparison). In bankruptcy, the initial plan was to close 155 stores and renegotiate leases to help improve the cash position. It wasn’t enough to salvage the nation’s second largest electronics retailer. The economy and especially weak holiday sales were a death blow. Ultimately, the news is good for Best Buy. The loss of its biggest competitor will help cement Best Buy’s already leading market stature, at least in the long term. For the next couple months, however, as Circuit City attempts to liquidate the estimated $1.3b of merchandise inventory its stores still hold, the deep discounts could create some margin pressure and steal away some Best Buy customers. The liquidations sales will begin tomorrow at the remaining Circuit City stores. Customers hoping for immediate extreme bargains may be a little disappointed. The sales will run until the end of March and will probably start slow and accelerate as the deadline looms. The process for the liquidation sale requires weekly reconciliations with the companies acting as Agents. This information, tallied every Thursday, will likely be used to set incremental discount rates as needed. The entire sale is governed by a liquidation agreement (we’ve made it available on Scribd via PDF here). The agreement sets not only the terms, but also the payouts. At the top of the list, creditors are guaranteed to get at least 70.5% of the “Cost Value” of the merchandise, plus expenses. The companies acting as liquidation agents will get a minimum of 1% as an Agent’s Fee with carve outs that can elevate the number based on the sale’s performance. Specifically, all proceeds above the 70.5% payout (and the 1% agents) fee will be split 70/30 (Merchant/agent) until the agents’ hit a ceiling of 3%. Any money above that, if there is any, will be split 90/10. All said and done, Stockholders will likely get nothing. The bankruptcy court has approved the liquidation agreement.